Bit of a let-down this. 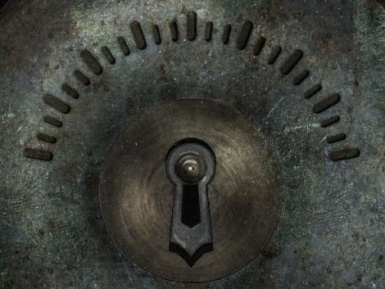 Shouldn't the graduations be from the centre of the lockpick not the centre of the lock? I don't find this all that more helpful than the vanilla texture with its pits in the metal. I would definitely use this if there were an option that looked like a thief's tool that gets placed over the lock, some people have said penciling by wax or charcoal, or perhaps a stencil of some sort. That's a neat idea, it would make more "sense" that the marks are placed by the lockpicker versus conveniently built into the lock. There IS it's exactly like this mod in almost every aspect except it does what you just described. 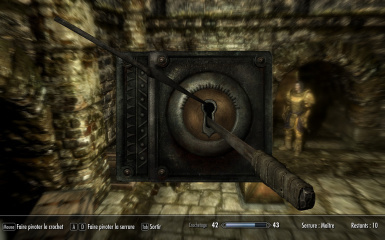 http://www.nexusmods.com/skyrim/mods/53071/? Ok...I cannot get option C to load. I do not have the HR tex packs...no esp's in my load order to uncheck...no bsa's to add to archive lines in ini file. Changed "t" to "T" and still no good. Blank lock face. Option B, however, had exactly the same problem UNTIL I renamed "Texture" to "texture" then put it back. Now option B works fine. Went back...re-downloaded "C"...did the exact same thing...nada...zip...zilch..bupkiss. I even reset AI just for S&G's. Loaded B back up, got it working and then changed "Texture" to "texture." Huh...imagine my surprise when graduations were still there. Still love the mod. Great stuff so endorsed. Thanks for listening. idk if you're still having the issue, but I just ran into it and thought I'd share how I fixed it- up the texture quality in the game launcher. If it's on low, the lock is all blurry and you cannot see the lines. I've been wishing for something lie this for a long time. Relocating the pick can make all the difference when getting around hardest locks at low levels. 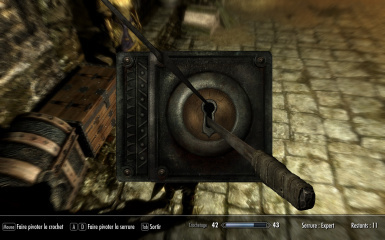 Best lockpicking helper textures on the nexus :3 endorsed! Thanks for this. 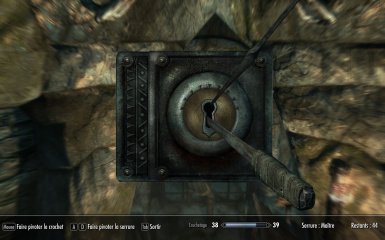 I'm not using any lockpick mods, and have no desire to, but this helped greatly reduce my frustration when picking locks. I'm using option B, as I thought it was a nice balance between A and C. I also didn't have any problems using this on top of the Bethesda Hi-Res texture pack. @ZeBuceta, this simply changes the texture of the lockpick UI to one with marks on it so you know where your pick was if it breaks and you have to try again. 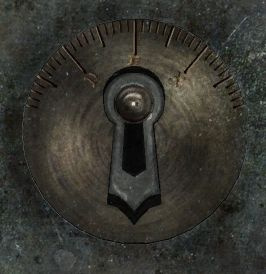 It's mainly useful while you are still leveling, and also if you aren't using any sort of lockpick cheats that allow 100% success.